Because We Can Bring the Best Results in the Shortest Period of Time Possible – Guaranteed! Acupuncture is not about puncturing the skin with needles hoping some miracle will happen. Acupuncture is to know the human body, not just its anatomy and physiology but also its interaction with nature and the environment, and to understand how its homeostasis is maintained and changed. Based on this understanding, an acupuncturist tries to manipulate the needles to control the flow of energy and circulation. it’s a skill that takes one’s lifetime to master. According to my experience, it takes at least 10 years to start feeling the subtle changes the needle manipulation makes. That’s why the outcome of acupuncture treatments vary drastically depending on who gives the acupuncture treatment. There are many different styles of acupuncture. Experienced acupuncturists employ different style and techniques suitable for the conditions of an individual patient. Chang’s acupuncture style combines qigong energy moving technique with acupuncture methods resulting in more effective and faster recovery. Patients feel deep relaxation during the treatment due to the fact that his/her energy begins to flow smoothly. In almost all illnesses including pain syndromes, metabolic disorders or emotional conditions, we observe blockage of energy and disrupted blood circulation, which manifest as specific symptoms and makes the recovery difficult. Originally trained in conventional medicine and science, Mr. Chang’s knowledge in anatomy and physiology enables him to select points that are less painful and more effective to stimulate the affected nerves. Also as a veteran qigong practitioner, we know how to harmonize and balance the energy to maximize the efficiency of the treatment. At Chang’s Acupuncture & Herbs, our first treatment goal is to balance and promote the smooth flow of energy. (That’s why another name for Chang’s acupuncture style is called “Qi Flow Acupuncture”.) 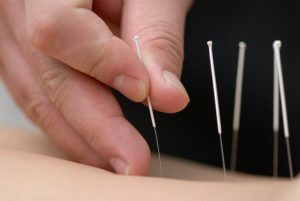 For that purpose, various techniques are used along with acupuncture – moxibustion, cupping, qigong exercise, manual therapy, herbs and even electric stimulation and laser therapy. In Oriental Medicine, there’s a famous classical statement that says “same treatment for different illnesses, different treatment for same illnesses” – meaning seemingly different symptoms may have the identical underlying cause or similar symptoms may have different causes. The process of identifying the root or underlying cause is called “pattern differentiation”. If the patterns are the same, you should use the treatment principle regardless of the symptoms, and even if the symptoms look the same, you should differentiate the root pattern to find out the real causes. As a “wholistic” or “holistic” medicine, it’s important for an oriental medicine practitioner not just to look at the symptoms and superficial manifestations, but to observe the inner working and connections of underlying systems. Sterile, disposable needles are used for acupuncture. Without this process, acupuncture becomes a mere act of needling. At Chang’s Acupuncture & Herbs, we try to look at the whole person and understand our patient before we start the treatment. We try to figure out the underlying cause of the disorder and correct the condition. That’s why we pride ourselves for the high success rate of our treatment protocols and our patients are very happy with our work. Acupuncture gets much more effective when you are relaxed since it loosens your muscles, which, in turn, helps with the circulation. It’s one of the reasons acupuncture in a hectic physical therapy office or in a hospital setting is not very effective compared to that in an acupuncture clinic. We try to provide more relaxing, zen-like environment for our patients. You will feel very relaxed and comfortable when you come in for the first time. Getting healthy while feeling good – isn’t that what a good healthcare practice should be? Better, faster result with lower cost minus the side effects and the danger of addiction – that’s what we are trying to achieve. Call us to get more information about acupuncture, moxibustion, cupping, herbs or any other oriental medicine procedures and how you can benefit from it. We only use FDA-approved, disposable needles. We are certified in herbology. You should get herbs only from certified herbalists to be safe.